Books to Light Your Fire: The Beauty Series by Skye Warren Super Book Blast! 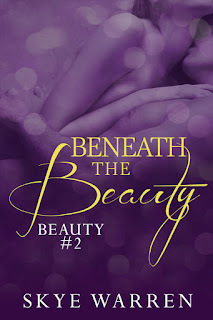 The Beauty Series by Skye Warren Super Book Blast! Maybe for the first time, she studied him critically. One half of his face was handsome, beautiful even. The other was matted with heavy burn scars from the top of his lip to his temple. His eye was still functional but the shape didn’t match the other side, giving him a lopsided appearance. She liked everything about the way he looked. The bravery of his military service, the bravery he showed going out into the world despite how people judged him. How precious it was that he’d lived, that he was with her. Suffused with sudden emotion, she shoved the coffees onto a cluttered file cabinet and launched her arms around his neck. He caught her with an oomph but soon after tightened his embrace into a hug. “What’s gotten into you?” he asked, laughing slightly. “You saw me last night,” he reminded her. His eyes darkened, and she felt him thickening against her belly. He was so quick to arousal, always ready for more. Holding his gaze, she slid her hand down his stomach, taut and flat beneath the button-down and undershirt she’d watched him don this morning. Her fingers crossed the ridge of his belt like it was the damned Rubicon—the point of no return. They were in his office, but they were alone… and damn it, she felt the need to please him. To pleasure him after those ridiculous girls had sullied him, whether he knew it or not. She found his erection, thick and pulsing. She loved her name on his lips. He gasped out something she couldn’t understand. It didn’t matter. His body told her what she needed to know: the heat beneath her palm, the shudder of his thighs beneath the smooth slacks. God, he looked good in a suit. She almost didn’t blame those girls for their gawking if they hadn’t been so cruel about his scars. She sunk down to her knees, pushing him gently against the wall. Their bodies blocked the door; no one would be able to walk in and see them. But someone could try, and what would their excuse be for blocking the way? Even worse, if someone outside were very near and very quiet, they might be able to hear the ragged breaths wrenched from Blake’s throat, the rasp of his zipper as she tugged it down, the low groan as she pulled him out, skin-to-skin. The risk excited her. So different from the safe circle of his bedroom. It felt, somehow, like a declaration. A statement of intent. He’s mine. Skye will be awarding a $25 Amazon Gift Certificate to one randomly drawn commenter during the tour and a $25 Amazon GC to one randomly drawn host. Follow the tour for more chances to win! What an exciting series! Thanks for sharing the excerpt. 'Love Me Some Cowboy' Release Day Blitz! 'Cream' by Zenobia Renquist Super Book Blast!